Microsoft Dynamics CRM 2011 comes with powerful goal management capabilities which can be utilized to set various types of targets, monitor progress against them and hence have the better control over the business. This blog post will provide details on built-in features like auto-calculated goal fields, out of the box charts and dashboards and how these can help to meet the targets. To make this more informative let’s walk through an example. Kevin is sales manager in a company. He has two sales persons Nancy and David reporting to him. 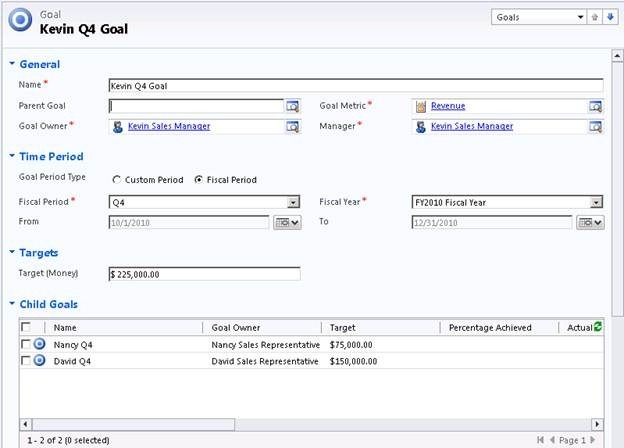 Sales goals using the out of the box revenue metric have been created by Sales manager Kevin for himself and his team consisting of Nancy and David. He has set the goal targets for all three goals in the hierarchy for the current quarter. Note: For details on how to accomplish this, please refer to earlier blog post here . When a goal is created for individuals, it gets read only auto shared with them. 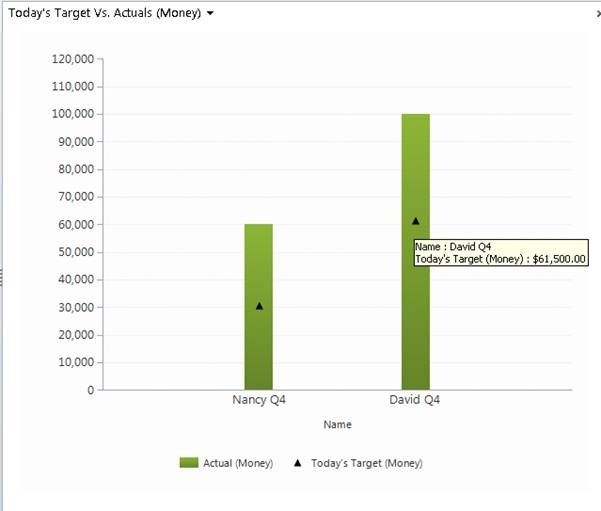 In this case Kevin’s reports, Nancy and David can see their own goals and hence corresponding targets assigned to them. Goal metric, goal start and end dates along with goal rollup queries provide them with the insight on what exactly is being tracked for this goal. Over the goal tenure, individual goal owners work towards meeting the goal target. 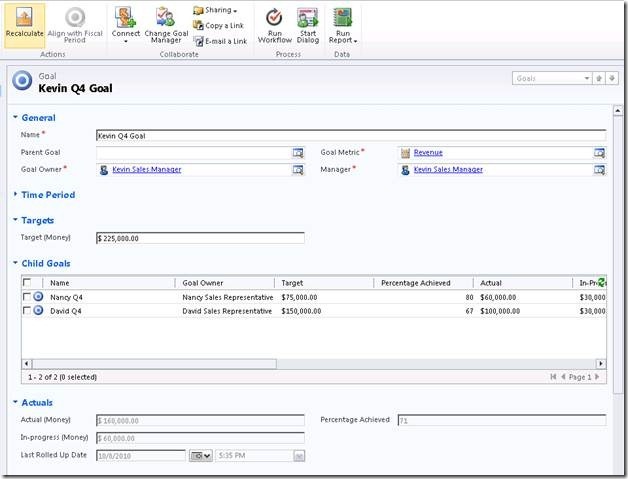 OOB revenue metric which was used to create the goals above tracks the actual and estimated revenue using the CRM opportunity entity records. 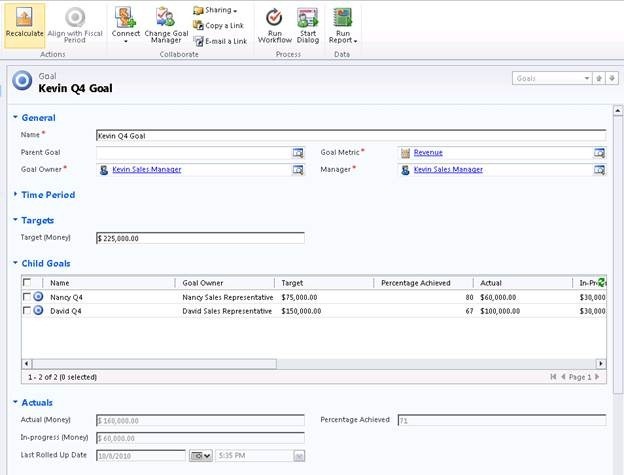 Nancy and David close some Opportunities and they mark them as won in Microsoft Dynamics CRM system, these become eligible for contributing to the actual revenue for their goals. They have also added estimated revenue values along with the estimated close date to the opportunities which they believe would be closing out in current quarter. In the middle of quarter Kevin wants to evaluate overall progress for the checkpoint meeting. He opens up his goal and is able to see the actuals and in-progress values for his goal. He can also see how much target percentage is achieved already. MSCRM system has the capability to periodically roll up the goal data every 24 hours (configurable) so that the updated values are present in the goal records. He clicks on the recalculate button to get the last minute updated data. 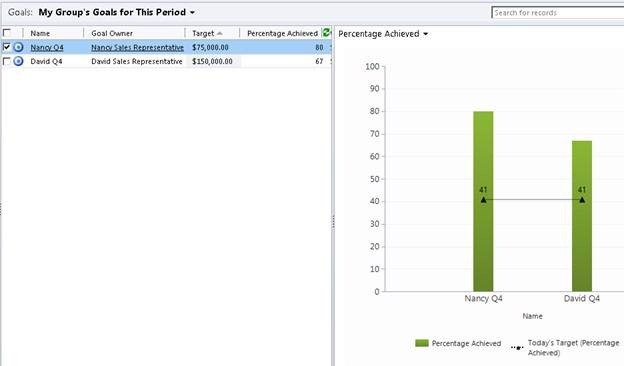 Microsoft Dynamics CRM System calculates and rolls up actual and in-progress revenue from the Nancy’s and David’s opportunities. Various fields in the goal form like Actual/In-progress Money, Percentage Achieved etc. are populated with the updated data. Please note that the rolled up data is summed up the goal tree as Kevin’s goal is the parent for other two. Fig 2: Refreshed rolled up data after the on demand rollup. Note: To understand the details of various goal fields and rollup please refer earlier blog post here. Kevin is happy to see that the 71% target is achieved for his goal. 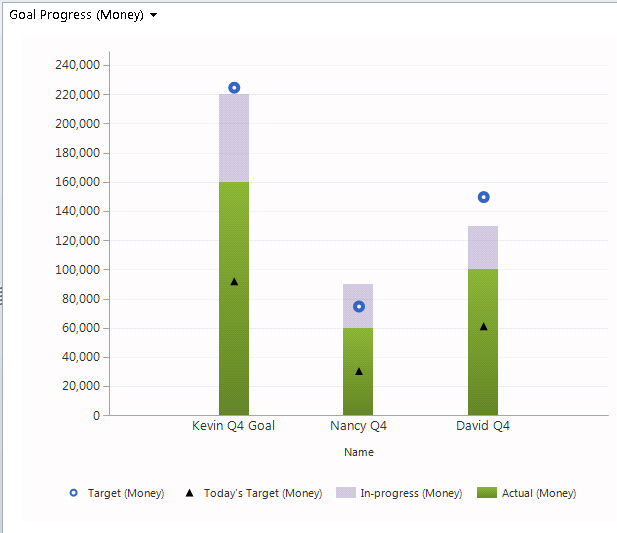 Inline child goal grid provides him information that Nancy and David are at 80% and 67% respectively against their target with satisfactory revenue in the in-progress bucket. 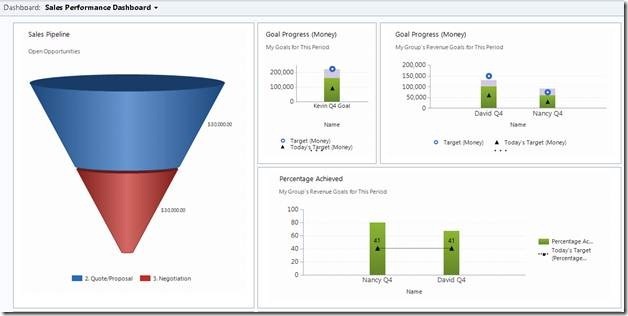 In addition to the system calculated percentage achieved field which is present on OOB goal form, there are few more fields present which are also auto-computed by Microsoft Dynamics CRM system and help provide the capability to better understand the goal projections and current state. A system-generated expected amount for Actual (decimal) against the target goal. A system-generated expected amount for Actual (Integer) against the target goal. A system-generated expected amount for Actual (Money) against the target goal. A system-generated expected value for percentage achieved against the target goal. Note: These calculated fields can be added to goal grids and goal forms from customization area. 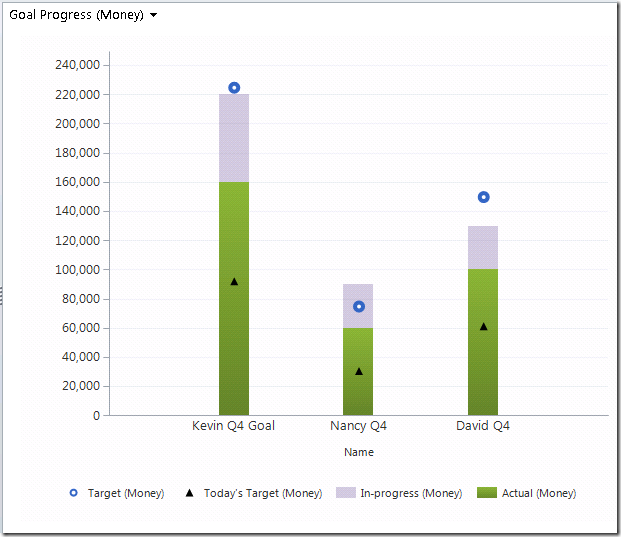 Kevin Clicks on the “view charts” bar on the goal grid and selects OOB percentage achieved chart. In addition to providing visual representation of values against the goals in the view, this chart also has the indicator for the today’s percentage achieved target. In other words this indicates what should have been the ideal percentage achieved value if there is a steady linear growth over the goal time period to reach 100% target. This chart has the power of displaying all the goal types (money/decimal/sum) at one place and provides quick visual representation of their percentage achieved status. Fig 3: Goal percentage achieved chart. 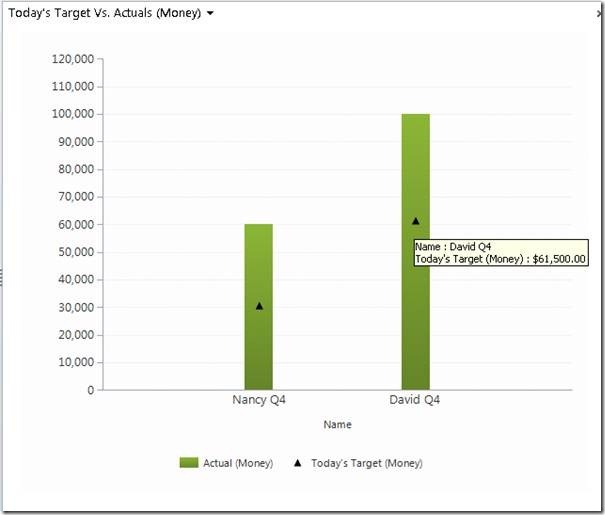 Since the goals in the current example are created using the Revenue metric (Money Based) Kevin switches to the “Today’s target Vs. Actuals (Money)” chart. This chart provides him information on what money amount is already achieved and what should ideally have been achieved by today. Kevin can hover over the today’s target link to see the exact values. Kevin is happy to see that the actuals are very promising. He finally navigates to all goals view in the grid and selects the “Goal Progress (Money)” chart to get the detailed overall picture. This chart provides him very useful information regarding goal target and how the current progress stands against it. This charts stacks in-progress money value on top of achieved money value which provides an indication of what can be the total revenue at end of the period. Bar for the individual goal has the markers for goal target (goal icon) and projected fields (small triangle) which helps in visualizing the overall picture. From the chart above Kevin concludes that the Nancy would overshoot the target easily but there are challenges for David. He also sees that aggregated groups revenue for his group which is measured by his goal (extreme left) is nearly on track and currently seems to be falling short by 5k. Microsoft Dynamics CRM 2011 provides out of the box sales performance dash board which provides the insight into the sales system performance. The charts discussed above are very informative for Kevin and these are present as sales performance dash board out of the box. 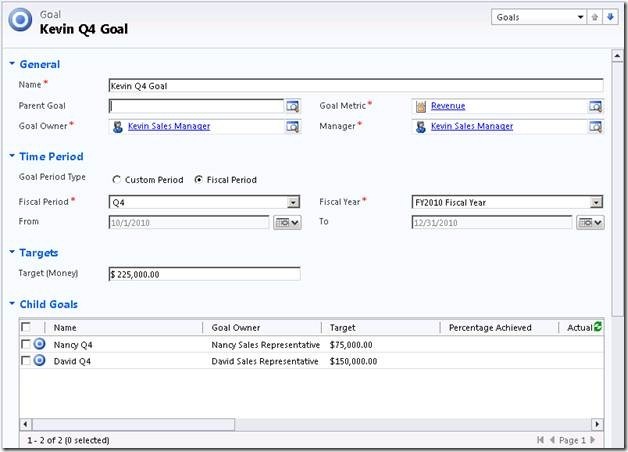 There are out of book (oob) views present which provide the capabilities of viewing the groups goal in addition to owned goals. Kevin sets this dash board as his homepage. Fig 6: Sales performance dashboard.